Maybe you follow Spaceworks because you love art in unexpected places, or maybe you’re looking for another reason to shop local at a creative small business. Maybe you just care about Tacoma. For whatever reason Spaceworks is in your life, we invite you to make a gift today to support our ongoing work. Help us continue supporting artists and creative entrepreneurs who are transforming Tacoma into an economically stronger and more culturally vibrant city. 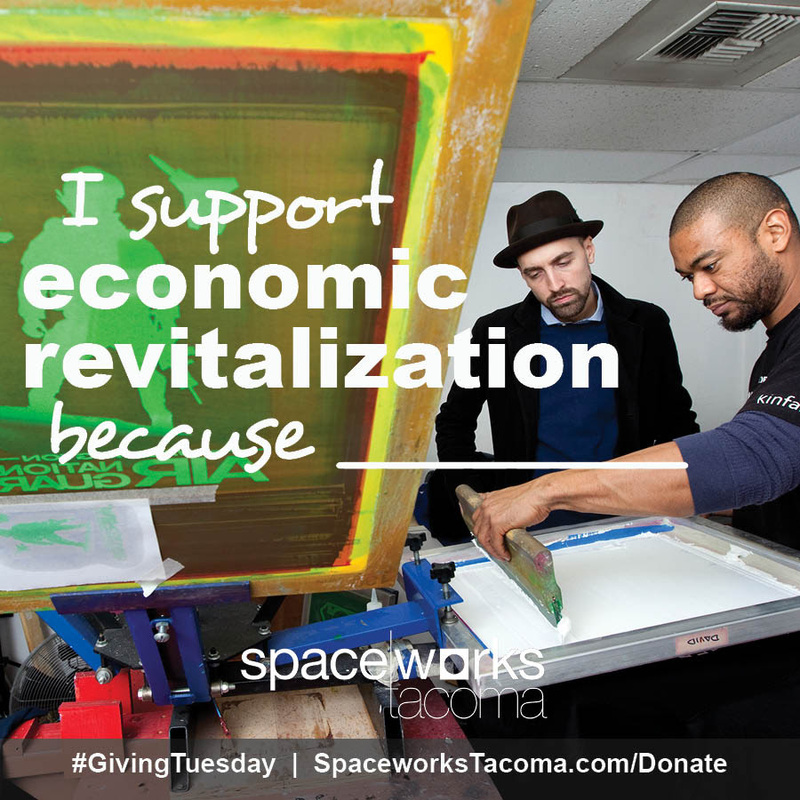 All donations go to Spaceworks but are processed through the Tacoma-Pierce County Chamber Foundation. Donations will appear as “TacomaPierce ChamberFDN” on bank statements. Pictured here is creative small business Spun Clay Arts Studio & Gallery. Jen and April went through our Creative Enterprise Program, which provides business training and support, and then we helped them find their new space at 923A MLK Jr. Way, where they’ve been since 2014. Pictured here is creative small business The Tshirt Men. Brothers David and Willie Combs went through our Creative Enterprise Program, which provides business training and support, and then we helped them find their new space at 923A MLK Jr. Way, where they’ve been since 2014. Picture here artist Erika Rier (www.erikarier.com) was commissioned by Spaceworks to complete a 50 ft. long window installation at the 1120 Creative House for it’s grand opening in March 2015.